The universal lathe of series CD model A is designed for various turiing jobs,such as turning internal and external cylindrical and taper surfaces as well as facing.The lathe with gap-bed can be used for turning the workpiece with big diameter or irregular shape. 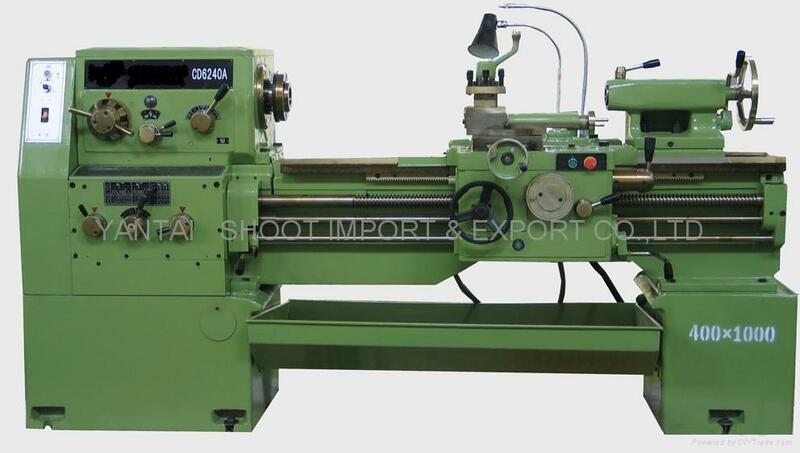 The lathe is equipped with metric or inch leadscrew according to the requirement of endusers,and can be used for cutting metric,Whitworth module,diametral pitch,circular pitch threads and drilling,reaming and lubricant slot broaching operations and so on. ◇ Pleasurable appearance,centralized control,and triple shaft gear-shifting mechanism in feed box.Various threads can be cut without reset the change gears. ◇ There are handles with figurative mark for cross and longitudianl feed as well as rapid moving mechanism in apron. ◇ Eccentric quick-clamping construction in tailstock. ◇ Load-relieving mechanism in saddle results in easy for moving,reducing of wear,eliminating of creep. ◇ Centrialized lubrication with outside circulation for headstock and feedbox reduces greatly the influence on machining accuracy from thermal deformation. ◇ In addition,Model H of Series CD can be provided.Its feature is basicly as same as Model A,but the spindle bearings are sliding bearings.The model is named by changing "A" to "H",for example,CD6140H.